I have used these in my cherry's and they are some mellow sweet sounding tubes. Great midrange. Here is a very nice warm tube with some good air on the top end and a very low noise floor. Notice the really tall bottle and pinched waste. Probably one of the best 12AT7's out there. I use these more than any other in the Cherry's. Also have a set of 12at7watubes made in France that have a nice open sound...kinda bright but definitely not harsh. These are labeled BugleBoy but are not made in Holland. I'm partial to RCA 12AT7/AX7, but I've not heard any of these you have yet, Eric. I'd like to get together with some folks and roll different tubes to get an idea of what other types sound like! Are the Brimar’s the same as the 6060? If someone actually gets a 275 running I'll have a pile of 12ax7 and 12at7's to play with. "These are the early Yellow-T logo that are excellent quality tubes. Rich British tube tone, made at the Brimar Footscray, U.K. factory, long life late 1960s vintage. This rare tube is the Brimar answer to the Genalex A2900. It has a similar construction to it." Here are some Siemens ECC83 dual post halo getter short plates. The can sometimes be found at a really good deal because everybody wants the long plates. I think these sound better than the long plates personally. Good all around sound and really tight deep bass. RCA 5751 Triple Mica Black plates. These will hold their own with any 5751 out there including the Sylvania 5751 Triple Mica Black plates. They sound better in the Cherry's than the Sylvania's, but the Sylvania's sound better in the phono preamp. They are fairly neutral and lack nothing. Tesla E83CC gold pins. Made in Czechoslovakia. Be careful not to buy the fakes. The way I understand it is that these were made on the old Telefunken ECC803S tooling that was bought from Telefunken. They have the same construction. Snoop65 turnedme on to them and they sound fantastic, very open clean sound with a bigol soundstage. Snoop is the expert on these so before buying some check with him to make sure they are the right ones. I think the link below are the correct ones. Those are the right ones Eric. 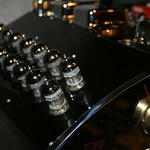 All other 12AX7 tubes have plate construction, the Tesla E83cc's are frame grid tubes similar to the construction of 6dj8/6922/7308 tubes. Also the Tesla E83cc's will have a halo getter with two support posts. Holy crap those are expensive pre-amp tubes! You could spend more on the pre/driver tubes than the amp!! The Telefunkens seem to work good in almost any application. I've never put them in and thought they sounded "bad". Yeah its kinda like the unspoken rule of buying a scope for your gun. Something to the effect of whatever you spend on the gun double the cost of the glass you put on it. I justify it as an "investment"....its like buying antiques and the value will continue to go up. Here is the holy grail 12ax7 that the Tesla E83CC is comparable to. Tesla is made with the original tooling this Telefunken was made from. Look at 2nd hand stores for old tube stereos. I found a Grundig unit with a complete set of 1963/4 Telefunken tubes for $25. They’re still around and my set tested strong. The EL84s sound really good in the 2011 amp. There are some new construction tubes that are very good. I run PSVane 12ax7s in my EAR. They replace the Mullard/EI/Telefunken tubes that came with it and sound better to me and the PO. I’m using some of the Telly’s and EIs in other gear spreading that luscious tubey goodness around. IIRC, EI was producing tubes on the old Telly gear in the 70s and early 80s before ethnic cleansing. They made some great tubes. My understanding now is the equipment is currently stored somewhere in the old Czech Republic.